We had a great launch for Washing Lines last Saturday. 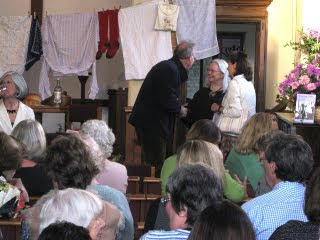 Janie and Barbara had decked the Methodist Church with washing lines and poetry and the church was full. 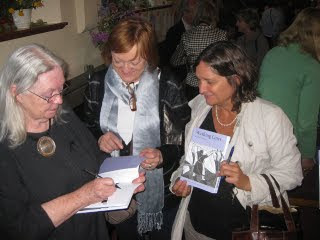 The photos show Gillian signing books after the reading, and chatting to Janie and her husband Nicholas just before the reading began. Barbara can just be seen on the far left. before she'd finished hanging out her sheets. She read a lot from Washing Lines, and from her own work. A treat was to hear unpublished, recent poems, including one just completed that day. She also read Shirt of a Lad, an anonymous poem translated by Tony Conran, which will surely be in a future edition of Washing Lines.